UK, 1968, 97 minutes, Colour. Stephen Boyd, Camilla Sparv, Michael Redgrave, Leo Mc Kern, Jeremy Kemp, Robert Hoffman, Jane Merrow, Carl Mohner. 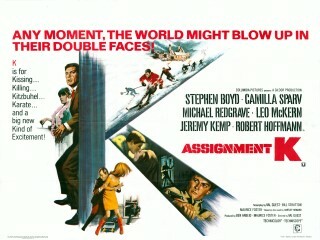 Assignment K is one of those spy thrillers that were very popular in the mid to late 1960s. Examples are The Quiller Memorandum and The Kremlin Letter. This is a more modest film, a British production co-written and directed by Val Guest, a versatile director of quite a range of genres over many, many decades. The British setting focuses on Stephen Boyd as the head of a successful company which produces toys – but this is merely a cover for his role as the head of a British spy unit. His girlfriend is abducted – and he is threatened with her death unless he reveals his contacts. The material is familiar but very competently done and the film boasts a supporting cast including Michael Redgrave and Leo McKern?. 1. Was this a good spy thriller? What were its best features? 2. What kind of spy thriller was this? How strong was the theme of disillusionment, the false glamour of spies? 3. Did this film reveal why people become spies? Motivations? Patriotism or greed? Personal achievement? Why do such spy rings operate? How much intelligence is needed to set them up? 4. What did the film have to say about relationships and their possibilities in such situations? The ever present reality of betrayal? How can relationships be hurt by betrayal? 5. What kind of hero was Phillip Scott? As a person? As a patriot? Did he have principles of integrity? How effective was his cover? His control of his spy ring? How interestingly did the film present this? 6. Harris: the official kind of spy, a manipulating, controlling non-feeling man? Were you surprised to find that he was a traitor? How disillusioning was this? Why had he succumbed to pressure? 7. Tony: merely romantic interest? Even when she became more involved in Scott's adventures? Did she love him at all? How ironical was her part in the film when you discovered the truth? Did you think at any time that she could be a spy? 8. Impressions of Harris and his spy ring? What were they after? the nature of their cruelty? The types of people they employed? Hal and Martine? 9. What did the film show of the mental and physical strain undergone by spies? The necessity of rapid thinking and ingenuity? 10. Spying involves the risk of murder and death. What right have spies to take other peoples' lives and to be involved in business that undertakes this risk? 11. Reactions to the final disillusionment? The fact that Harris had been bought and that Tony was a traitor? Was there any alternative for Scott but to leave his spying, disillusioned? 12. How plausible was this story? How plausible did the film make it? What is the purpose of making this kind of film?